Michael Keller is specialized in two- and threemovers. The Keller paradox is a direct mover theme that requests that "White moves to a square just controlled (or controlled again) by Black." In 1994 Friedrich Chlubna wrote the collection "Michael Keller. Ein Meister der Schachkomposition" comprising 279 problems by Keller. Michael Grushko composes in all genres but mostly fairy problems and especially miniatures or Wenigsteiner with neutral pieces and several fairy conditions. You may read here a short portrait of him made by Leonid Lubashevsky on "Kozatska Shakhivnytsia". In ChameleonChess, all pieces are Chameleons. Chameleon echo mates in opposite corners. Valery Gurov is a well-known composer, involved in composing, judging and organizing chess problem tourneys. 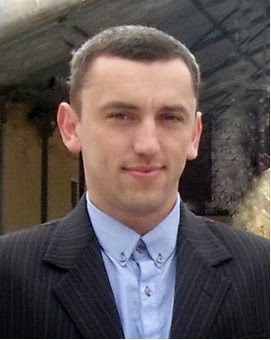 He is the helpmate editor of Uralski Problemist. Pinning, pin mates, annihilation of white units, exchange of functions between two pairs of white units. Very nice Madrasi strategy: two initially paralyzed black and white units are unparalyzed by the black Queen, White creates a reciprocal B-R battery and the created white battery fires with a final Madrasi effect. Sergiy Didukh is a young talented composer whose endgame studies have already been remarked by judges. He was also noticed for his sense of humour and his articles in varied magazines (Mat Plus) or his column in The Problemist before Yochanan Afek came back. Some of his studies are reproduced on jmrw.com and his blog here. Here the detailed solution of an excellent study of his, presented by Brian Stephenson. 1. Be6 ! dxe6 2. Bd6 ! 2... Qc3 3. Sd4 ! Qxd4 4. Re5 ! A funny staircase manoeuvre of the white Rook and black Queen and total sacrifice of white pieces in order to force the stalemate.